f13.net forums - Unit (Guild) creation "announced". f13.net | f13.net General Forums | The Gaming Graveyard | MechWarrior Online | Topic: Unit (Guild) creation "announced". 0 Members and 1 Guest are viewing this topic. Which means we'll have them in about a million years. Woohoo. Not to mention that OMG what a feature! We'll be able to create guilds! Good job PGI, you are so good at this! Well it has been a rapid development cycle but we now have the Clan Invasion underway. A lot of blood, sweat and tears went into getting these new 'Mechs into your hands and we already see the dynamics of gameplay changing on the battlefield. This venerable force returning to the Inner Sphere homeworlds is the biggest event to happen on the BattleTech timeline and we, at PGI, are glad to be able to bring the beginning of this experience to you. It is now 3049 on the timeline and the remainder of this year is going to see a lot of new developments both in game and in lore. It is at key turning points like this that allow us to bring new systems on-line and address the needs of the network of features required for the upcoming Community Warfare push. We're pleased to let you know that the first module entering development is Unit Creation. 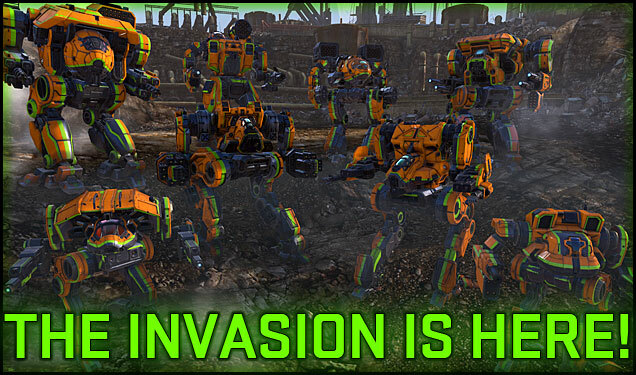 Units, being the MechWarrior Online equivalent of guilds, will be a new way for friends and like-minded players to get together in both a social and game affecting manner. Social interaction, member management, Unit ranks and specialized chat channels are some of the key features within this module. This in turn will be the gate for the bigger features of Community Warfare like faction combat, planetary control and partaking in the giant battle for the Inner Sphere. Today is a very exciting day for us as it is the first step in the exciting times coming in the near future. Today we raise our glasses to our community and supporters who have been here with us and we look forward to bringing you the content that we all want that will make MechWarrior Online the game we want it to be. To create a Unit, players will need to click the Faction tab in the main UI. On the Faction tab is a button labeled “Create Unit”. This is only available if the player is not part of a Unit. If the player is not part of a Unit, they will be prompted to name their Unit. After naming the Unit, the Unit Leader can set a Unit Tag. The Unit creator can now invite people to their Unit through their Friend List. Units can collect a communal C-Bill coffer through donations from its members. Units can create ranks and assign Unit management permissions to each rank. Units have their own Unit and Officer chat channels. View Unit coffer transaction log. Disbanding a Unit can only be done when there is only one player left in the Unit. NOTE: Unit Leader Privileges are locked and cannot be taken away. Kick members (Unit Leader is the only exception). By default, the Unit will be populated with basic US military ranks. Please note that “coffer” actions are for future feature support. This is the initial feature set planned for Unit Creation and Management and is step 1 on the path to Community Warfare. On a side note, I've seen the rumblings of people thinking that mixed teams of Clan and IS 'Mechs will be the norm from here on out. This is not the case. Faction (IS/Clan) combat is a big part of Community Warfare as are the skirmishes between the Houses themselves and the Clans themselves. This requires additional work to the database, player data and match making systems and will come out at a later time. "will come out at a later time"
Guilds in this context being a chat channel and friends list that Falconeer curates on my behalf? I'd be happy to oblige if this function managed in any way to make it easier for people from here to play together. Then again, I'm afraid that when time will come the few of us still playing will have to find some other Corp. to do Community Warfare with. An f13 Merc Corp. would be fantastic, but seems like everyone has aleady left and that ship has sailed. I still log in occasionally. Now I would favor a Steiner unit, but only if one of my old ones was still around, so I'll probably be one of the three f13 people who ever log in. I'll reinstall the game once CW hits (in some game affecting way) but since I'm a euro my playtime is different enough to make any f13 action rare. Confirmed, coming August 19th. In two weeks! Exactly two years later, Bat Country assemble? We'll see whether I'm AWOL in-game or not. I bought my hero 'mechs with hoarded MC and haven't even bothered to customize or use them. So, I need your help. What should we use as a guild tag? In the meantime, they opened pre-registration and we are all set. Somehow I'm not surprised they delay something again. Luckily it isn't any longer delay...atleast for the moment. f13.net | f13.net General Forums | The Gaming Graveyard | MechWarrior Online | Topic: Unit (Guild) creation "announced".